You long for a marriage marked by lifelong love, intimacy, and growth. And it can be yours -- if you set wise boundaries. Boundaries are the "property lines" that define and protect each of you as individuals. Get them in place and you can make a good marriage better and possibly even save a less-than-satisfying one. By the time you've completed this workbook, you will know yourself and your mate better than ever before. 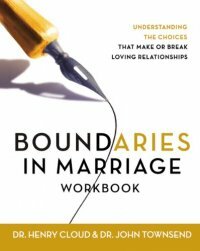 You'll also understand and practice the ten laws of boundaries in ways that can make a real difference in your relationship. Step by step, the Boundaries in Marriage Workbook helps you apply the biblical principles discussed in the book Boundaries in Marriage so you can . . . Set and maintain your personal boundaries and respect those of your spouse - Establish values that form a godly structure and architecture for your marriage - Protect your marriage from different kinds of "intruders" - Work with a spouse who understands and values boundaries -- or work with one who doesn't -- Filled with self-tests, questions, and applications, the Boundaries in Marriage Workbook helps you deal effectively with the friction points and serious hurts in your marriage -- and move beyond them to the mutual care, respect, affirmation, and intimacy you both long for.